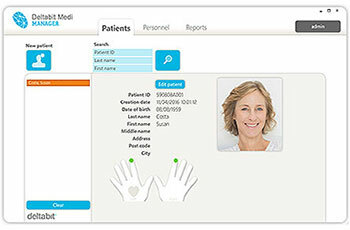 Secure patient identification from sign-in to treatment, now easier than ever. 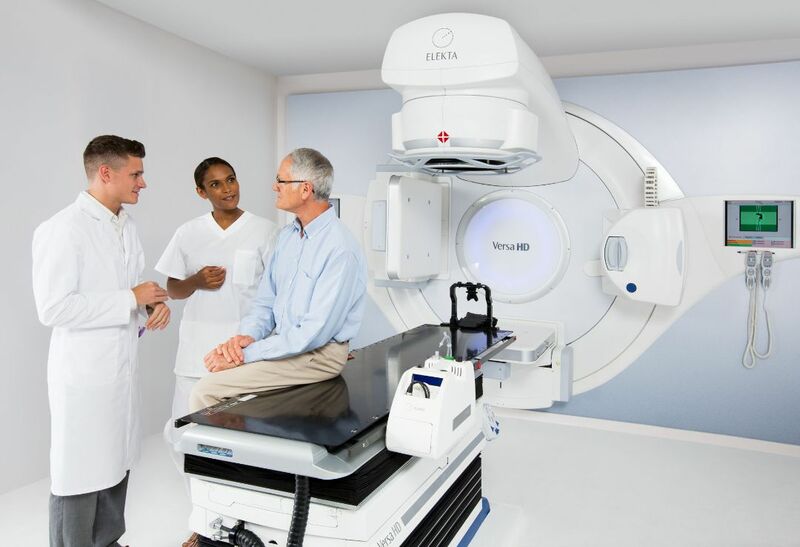 Deltabit Medi ensures that the correct patient receives the radiation treatment for cancer. 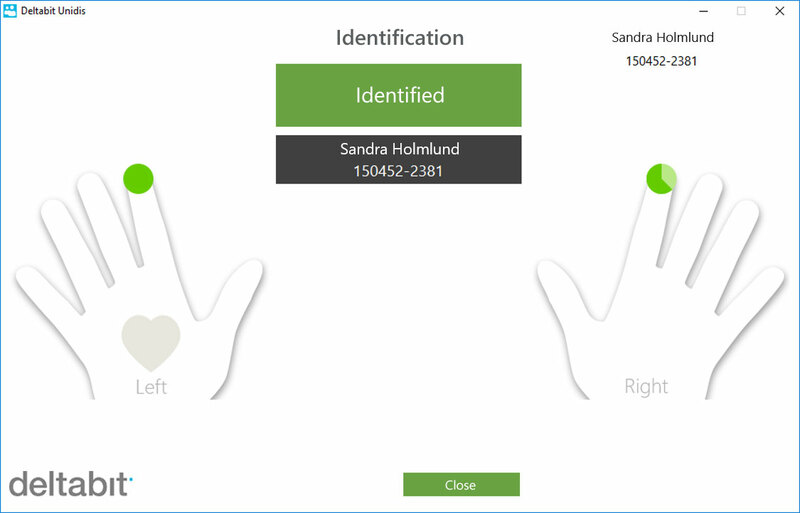 Use fingerprint-based identification to facilitate the self-service signing in to appointments. Faultless patient identification guarantees correct treatment in the most critical situations. Deltabit Medi ensures that the correct patient is treated with radiotherapy for cancer. Over 3 000 000 treatments have been administered with it – and each time to precisely the right patient! Especially in radiation treatment, it is important for the right patient to receive the right treatment since patient identification errors may have serious consequences. For maximum certainty, the patient is identified through fingerprints. This reduces the risk of forgotten identification cards or mixed-up names. Thanks to constant further improvements, the functionality today is of unquestionably superb quality. 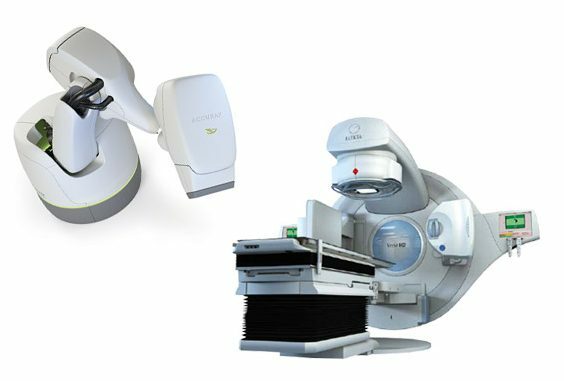 Deltabit Medi is compatible with most radiotherapy systems. Our solution is flexible – you can add fingerprint identification to an existing system or get it for a new system. Deltabit system can be used for sign-in for treatment appointment, and for identification when the patient enters a treatment room. You can retrieve a patient’s data from the oncology information system to avoid enterind data in the system twice. 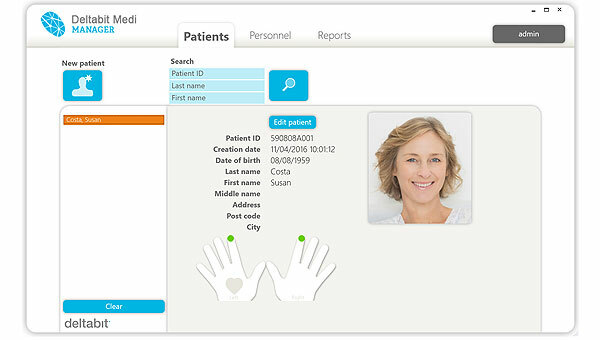 The Deltabit Medi patient identification system has been in use since 2004. It is easy for patients, because they do not need to remember or carry anything extra, like a barcode bracelet. Hospital personnel are also happy with the system. With the help of the Deltabit Medi, the probability of treating the wrong patient has been minimised. How does Deltabit Medi work in radiation therapy? Fingerprint identification requires enrolment of a numeric template from a high-quality fingerprint. The fingerprint is enrolled during treatment planning, usually when the patient is visiting the hospital for the simulation session. 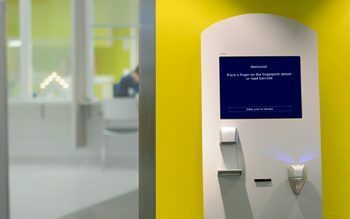 Enrolment requires a computer with the Deltabit Medi Manager application and a fingerprint reader. The whole process is very simple and typically takes 2–3 minutes. Since Deltabit Medi can retrieve the patient’s name and ID from the most common oncology information systems, the patient needs to be created only once in the system. The patient’s identity is verified by means of a fingerprint before each treatment session. Identification is performed via a computer with Deltabit Medi Identification application and a connected fingerprint reader at the entrance to the linear accelerator room. When a patient’s treatment plan is opened in the record & verify application, the Deltabit application enters the identification mode and waits for the selected patient’s fingerprint. When the correct fingerprint is identified, the interlock is cleared and the linear accelerator beam may be turned on in the normal manner. 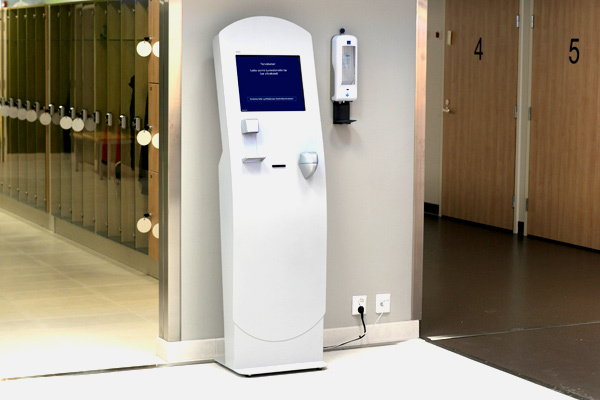 With the Deltabit Check-In sign-in and queuing system, patients can easily sign in using only their fingerprint. Queues will become a thing of the past and you will always have access to up-to-date waiting status information. Deltabit Check-In is a next generation sign-in and queueing system developed for health care. It can be used by, for example, radiotherapy patients to sign in to the daily treatment with their fingerprint, easily and safely. Thanks to the fingerprint, identity can be confirmed in a secure and easy way. And what’s best, there is no need to carry any identification document, such as an ID card. Calling for treatment can be performed with the call-up number without announcing or showing the person’s name. This way, privacy is maintained at both sign-in and calling for treatment. Fingerprint identification ensures that the identification is always registered to the correct person and the risk of human errors is minimised. The patient’s queue number can also be maintained unchanged during the entire course of therapy. This way, the number need not be printed again every time. 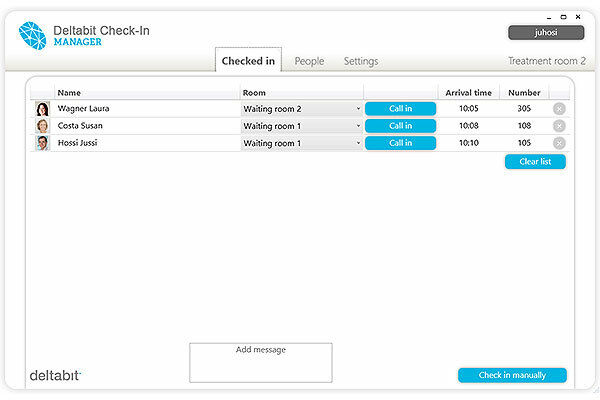 A room-specific message can be shown to the patients when they sign in. 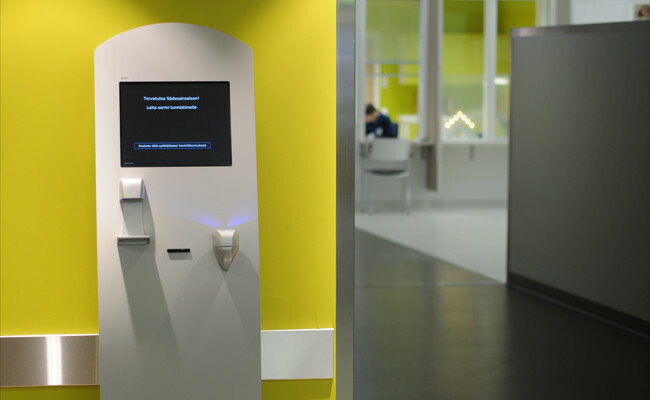 For example, if the operations are behind schedule in a specific treatment room, a message can be shown to the visitor as soon as he or she signs in using the self-service terminal. This reduces the level of uncertainty and the number of inquiries. The automated operation of the self-service sign-in saves time for the personnel. And thanks to the fingerprint identification, there is also the human touch involved. The call-up program can be used to call the patient to the appointment easily with a single click. If the patient has several appointments during the day, the call-up program shows the location of the patient at each time and the points of time when the patient has moved to another place. No more wondering and looking for people. After the appointment, the patient’s treatments for the day or the entire course of therapy can be marked as completed. The patient can also be transferred to wait for the next appointment, if there are several appointments during the day. All appointments are logged in to the system automatically. Deltabit Unidis is a general-purpose patient identification system for identity verification. Each personal identification number matches only one person, and each person has only one personal identification number. Deltabit Unidis recognizes the patient biometrically and checks that they have not been previously entered into the system under another name. 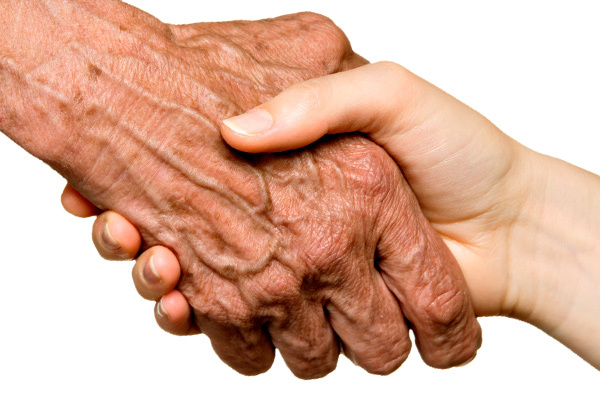 This way you can be sure that the treatment is given to precisely the right patient. Biometric patient identification is exceptionally challenging to implement in a reliable way. The experience Deltabit has accumulated over the past two decades guarantees top-rate functionality. Deltabit Unidis has been designed to be integrated into almost any health care system. This can be, for instance, a patient record system or software that is used for planning and actualizing treatment. Deltabit has extensive and diverse experience in connecting software. That’s why the projects are quick, efficient and high quality. Tell us what you need, and we will make it happen! Fingerprint identification is an easy way to identify a person. But how does it work? We make acquisition easy. Only three steps required. We’ll identify your needs, whether they are simple or more challenging. How many fingerprint points? Are connections to other systems required? We’ll make you an offer you can understand at a glance. The prices are clear, and the fees are not dependent on the amount of users. We’ll make the possible connections with other systems. We’ll also take care of the installation and solve your problems quickly.